First right of the bat, this is awesome template. I've been waiting for something like this literally for months, since i am to lazy to create one on my own. I am not using any popular joomla template. I have built the custom one using Bootstrap 3 and this is the first conflict i ever had in months. Last edit: 1 year 8 months ago by Sinisa Krisan. 1 year 8 months ago	#557 by Eugene S.
Sorry for the delay with reply. I was on the vacation. The error you have reported about occurs due to 3rd party script since RND KGlorious has no such issue (we have checked it on local site). I suppose it might happen due to Joomla template or any custom script used on your site. Temporary assign default Joomla template (Protostar) or RND KGlorious template for Joomla. 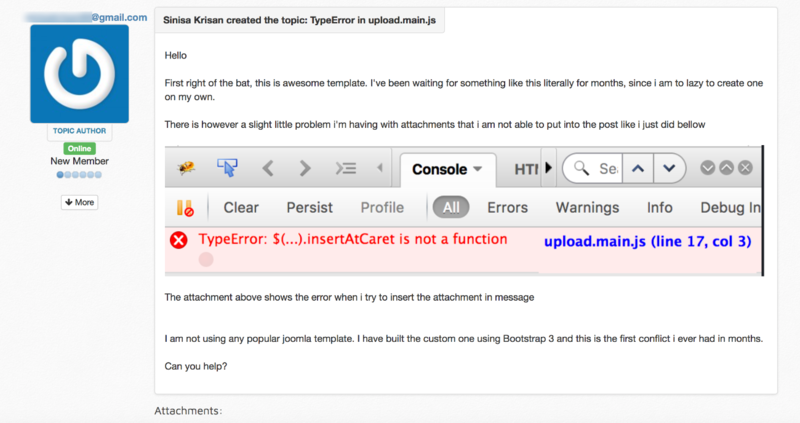 If the error won't appear anymore it means that your custom Joomla template makes a mess. If the problem still exists, then it is time to examine which 3rd party extensions are installed on your site and try to disable them to find which one causes the issue. As soon as the script that causes the error will be found, then you can think how to replace it with an alternative solution. Anyway, I have to mention that RND KGlorious is made with Bootstrap 2 and users should use this Kunena template with a Joomla template that has no conflicts or compatible to BS2. Can you explain, please, where the e-mail is displayed? I don't see it. There is your name above the avatar. As concerning the user page (if to click on your username), it is available for registered users only and bots won't proceed. Hope you had a great vacation Eugene. Welcome back. I'm not sure why that function is being extended within jQuery namespace, though it should still work, for some reason it doesn't. Once i changed it, it started working.